"The Twilight Saga: New Moon" has just added some members to the La Push werewolf pack. Summit Entertainment announced today that they have casted 5 Native American actors to fill out the wolf pack in the Twilight Saga. The werewolf's or shape-shifters in the Twilight Saga, defend humans from the vampire attacks. In "New Moon" Bella is sucked into Jacob's world with Edward removing himself from Bella's life and traveling to Italy to visit the Volturi. Actors Chaske Spencer, Bronson Pelletier, Alex Meraz, Kiowa Gordon and Tyson Houseman will members of the pack. 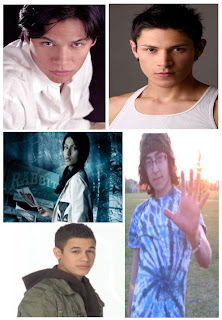 No word is given to who they will play, but there is Sam Uley (leader of the La Push pack), Quil Ateara (One of Jacob's wingmen), Embry Call (Another one of Jacob's wingmen), Seth Clearwater (first transforms in New Moon and is the younger brother to Leah Clearwater, the only known female werewolf), Paul (considerd one of the biggest wolf's) and Jared (First to phase after Sam). There are other pack members, but play smaller roles till later books. Kiowa Gordon could be potentially playing Leah Clearwater (I only say that because she's the only female in the bunch casted), but the rest of them are too close to call. "The Twilight Saga: New Moon" is set to hit theaters November 20th. In other realted Twilight Saga news, Variety reports, Summit Entertainment has hired Juan Antonio Bayona to direct the 3rd film in the Twilight Saga, "Eclipse". His work on The Orphange was outstanding and only increases my anticipation for the 3rd film in the series. Honestly he is a much better choice than Chris Weitz who is directing "New Moon". "Eclipse" is set to release June 30, 2010.